Beauty company Dove are offering a beauty promotional product alongside their shampoo range. For each of these that you buy, a nautical bag will be included as a gift with purchase. Though something as simple as a bag may not seem like much, it can have excellent effects on purchases. Below we will analyse why a similar promotion could be of benefit to your business, and how it can be improved. Stimulate sales: The best way to grab someone’s attention is to give them something free of charge. 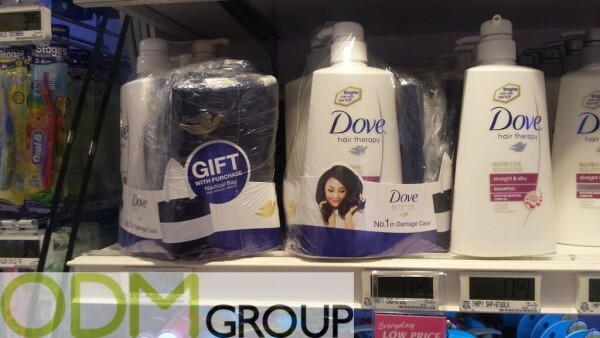 By offering a free gift with purchase like Dove have here is a great way to increase sales. It will really make the customer feel that they are getting value for their money. This is due to it adding a considerable amount of value to the initial product offering. Practicality: A beauty promotional product must be something that customers can get significant use out of. In this example, bags can be used in many different ways, and is something that everyone can and will use at some point. Offering an item with practicality such as this will encourage sales even more. Customer Retention: Nearly all customers will side with a company who offers more than their competitors. Therefore, constant use of a beauty promotional product are more likely to make customers stick with your brand in future. There are ways in which to improve on this beauty promotional product however. Once such avenue would be to offer a new product range as a gift with purchase, as this is a brilliant way to strengthen your position in the market. It is a fantastic way to test the popularity of these new products and increase sales at the same time. If it is well received, then the complimentary product can be added your company’s product range. Additionally, the packaging and display of this promotion could be improved in order to stand out on the shelves more. Simply having the bag on display for customers to see, or setting up a promotional display such as the one above could also bring in further customers. 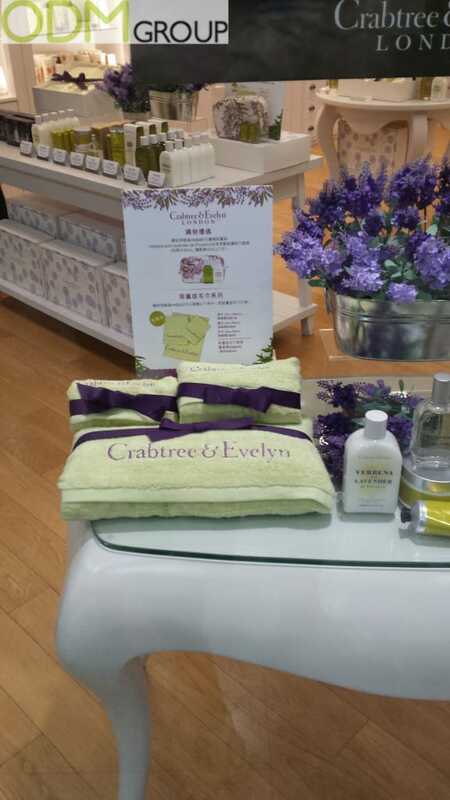 Here we can see how Crabtree and Evelyn have created a welcoming and engaging display, which is sure to bring in those who see it. It will also increase the perceived value of their products as well. Read our full Promo Gift Giving on Crabtree and Evelyn blog for full details. Overall, it is clear that Dove’s beauty promotional product will have positive effects on its business. But combining it with other factors such as a POS display and packaging can ensure that your product is well above others. See our blogs on POS displays and premium packaging for specific examples of this. Feel free to contact us to learn more about how to successfully market a beauty promotional product. Or instead let us assist you in coming up with some new and innovative ways to promote your brand.